" Star Child, written in a fairy tale genre similar to The Little Prince and The Alchemist is a book for young and mature adults. It explores in a simple and poetic way the challenges facing two “star children,” Terra and Marius, on their journey to learn about being human. Set in in a faraway time and place, they confront the same problems of modern humans: fear, loneliness, the need to please, and the stigma of showing their true selves when they do not fit in with those around them. Betraying their own hearts, each gives up or misuses the very things, the special powers, that make them unique. Along the way, they encounter wise teachers in the creatures of the sea and earth, the trees of the forest, and the elders of their world. Readers will meet the mysterious Ancient Mother, the village baker, a pod of playful dolphins and an ever-present loon. Young hearts and old souls will treasure their travels with the star children in this tale of their magical journey back to themselves and each other. 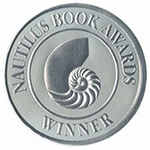 Winner of the Silver Nautilus Award, Young Adult Category "Better Books for a Better World"